Nō mask carver Bidou Yamaguchi launched out in a new, heretical direction in 2004. He began to fashion three-dimensional “masks” inspired by icons of Western art, like Leonardo da Vinci’s Mona Lisa. The masks compel us to reconsider these famous visages divorced from their settings and to question our assumptions about “appearance” and “reality.” Recently Yamaguchi has been inspired by the enigmatic woodblock print artist Tōshñsai Sharaku. As with his masks of Western masterpieces, he fastidiously reproduces every detail, including damage to the prints caused by mold and soiling. Part of the mystery and gravitas (conveyed by the Japanese term yugen) of historical Nō masks derives from their age. Even traditional masks depicting young women possess a numinous quality, owing in part to the masks’ timeworn appearance. 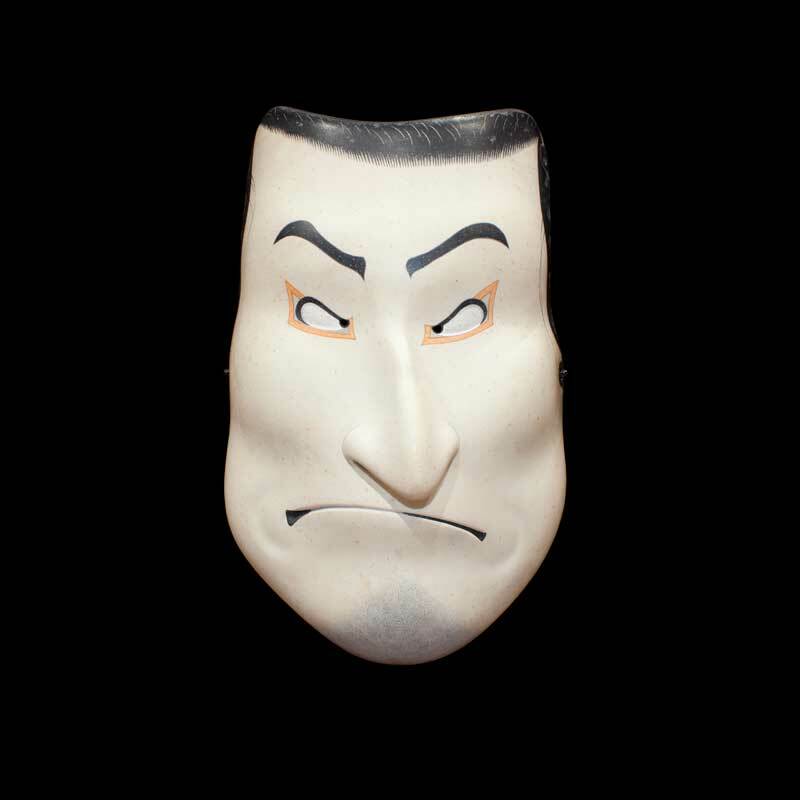 Based on a design by Sharaku, this mask represents the actor Ōtani Oniji in the role of Edobei, a manservant in the play Koinyōbō somewake tazuna performed at the Kawarasaki Theater in 1794. In the play, Edohei is a villainous thief and robber. ©2011 This exhibition presented by the Minneapolis Institute of Arts with Lead Sponsorship by the Friends of the Institute.